Go easy on the decorations – Some holiday decor can help make your home more inviting, such as a wreath on the door or a holiday tree in the living room (provided you have the space for it). However, you don’t want to overwhelm buyers with massive light displays all over your yard and roof. This can look tacky and can be a real turnoff. Avoid religious decor – You don’t want to offend the religious sensibilities of potential buyers, so try to avoid decorating your home with religious holiday decor. For example, you might not want to put that life-sized nativity scene outside your front door. Create an inviting and cozy atmosphere – If you have a fireplace, build a fire so that potential buyers feel comfortable the moment they step in from the cold. A couple of stockings hanging from the mantel will add to the holiday spirit without being too overt as well. Add throw pillows and blankets to your furniture to add both physical and visual warmth to your home’s interior design. 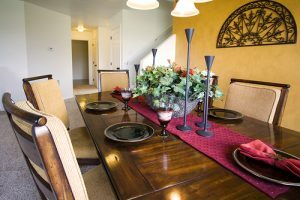 Use these tips for staging a home during the holidays to make homebuyers feel more comfortable and at home.